In retrospect postponing the Glenbrittle meet from the arranged weekend (which had a dodgy forecast) to the one after was a good one, the end of May bank holiday coinciding with the best weather one could possibly hope to have on Skye and a midge count of only 5m/inch2. Alison and Kenny were climbing and walking in Skye for much of the week. I joined them after an early start on Thursday and we hoicked ourselves up Window Buttress onto the Sgurr Dearg ridge, bumping into EMC member Perry en route. It was busy, but there wasn’t much discussion about what to do next – “I’m not coming all this ******* way not to do the ****** Inn Pinn”. We met Aussie Adam who was chancing his way along the ridge; he and I waited politely behind some nervous folk whilst Kenny ploughed up regardless and we abseiled back down on Alison’s rope. I had a refreshing swim in the lochan after the An Stac screes. The Old Inn was FTB in the evening. Aussie Adam rocked up at around 10.30, staggering slightly. Fair play to him, he’d winged his way along the entire ridge in 2 days! Fiona and Mike joined in the fun on Thursday night. They climbed Cioch West, Arrow Route and Integrity in Sron na Ciche on Friday – Gabbro tastic although Arrow route is almost completely unprotected. Martin Moran has described this as “perhaps the finest route combination”. I did a monster MTB ride from Sligachan to Camasunary along some wonderful singletrack, over Am Mam and through exquisitely deep bog before an endurance road ride alongside the bank holiday rush traffic. The masses arrived after most of us had gone to bed. Saturday saw a mass assault on Pinnacle Ridge, to my last Skye Munro Sgurr nan Gillean; on to Am Basteir and a fun descent via Kenny’s subterranean route which involves a bit of caving and some slimy walls. Kenny, Alison and Helen descended whilst Antti, Julian and I went on to Bruach na Frithe. We missed Monty and the two Clares, who had also been up BnF, as they were having a pants swim in the plunge pool. We all ended up in the Slig at various times; our party even met a famous dog, who had ascended SnG with the aid of a karabiner harness: https://twitter.com/Blazespage. Kat and Chris did the round of Coire Lagan including An Stac. There was concern at one point as a chockstone came away in Kat’s arms and a relaxing introduction to the Inn Pinn was a perfect tonic. Mike and Fiona bagged an entire half of the Cuillin starting at the south and culminating on the Inn Pinn via various Munros and tops. They met up with Kat and Chris on the way down Sgurr Mhic Choinnich and continued up An Stac and the Inn Pinn in a group. It was a squash in A&K’s tent on Saturday night on account of the vicious midges. On Sunday a group consisting of Helen, Antti, Kat, Chris and Julian set off for Banachdaich, Ghreadaidh and Mhadaidh including the four tops of Mhadaidh which Helen had been eyeing up for a while. The visibility was excellent (quite a lot of which was vertical) and the Fairy Pools were full of swimmers on the descent. Mike and Fiona also did the same 3 Munros ascending via Coire Bannadich and down via An Dorus. They didn't bother with the four tops of Mhadaidh though and were back early enough to have ice cream in the sun go and buy beer from that well known drinking establishment, the SYHA. Monty was subjected to a full day of not just one but three Cla(i)res and we had fun walking up to Coire a Ghrunndha, scrambling onto na da Bheinn and across to Sgurr Dubh Mor. Some couldn’t resist the call of the loch on the way down; this being the first of two swims of the day for Clare A. Alison and Kenny, Cuillin-ed out after a week on the ridge, had decamped to Neist so they missed out on kite flying and a “boil in the bag on the beach” meal at Glenbrittle on Sunday evening until the sun set. There was no let-up on Monday: the 5 sisters of Kintail for Antti and I, A’Ghlas Bheinn for Clare (more swimming); Kat and Chris were on the TD gap and it took only an hour to scrabble down to Glenbrittle from Sgurr Alasdair down the stone chute. Whilst negotiating the TD gap Kat overheard a watching climber state “that guy [Chris] will have her up there in no time”. Fortunately for him, Kat was concentrating on her own survival and didn’t realise how sexist/rude this was until later on by which time he was on the opposite side of the gap and out of smacking distance. Julian and Helen meanwhile were on the Cioch (Arrow Route and Wallworks) and didn’t get back to Edinburgh until after 2am. 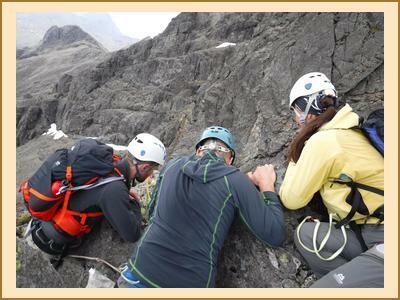 Mike and Fiona scaled the northern three Cuillins via the route taken by my party on Saturday. Unfortunately Fiona realised on the way home that they had missed out a Munro Top next to Bruach na Frithe. 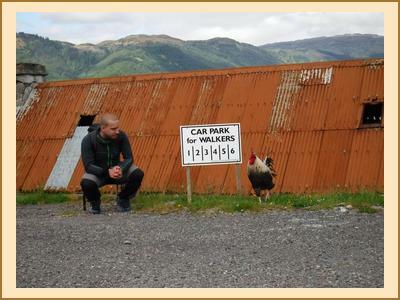 This will require another visit to Skye to rectify, guys! A fantastic meet, more of the same next year please!